Idea: When it comes to noise, the Arsenal fans are always there to power their players to victory. We decided to extend this energy outside the stadium and literally power the community. Role: Concepted and executed the campaign, pitched the idea to a panel of esteemed judges and tried really, really hard to like men's soccer. To tease the launch of the new kits – nicknamed Forever (Red), Future (Blue) and Victorious (Yellow) – we placed noise-activated ads at bus shelters to let the power of the fans reveal the new jersey designs. Casual fans probably don't own an Arsenal jersey. 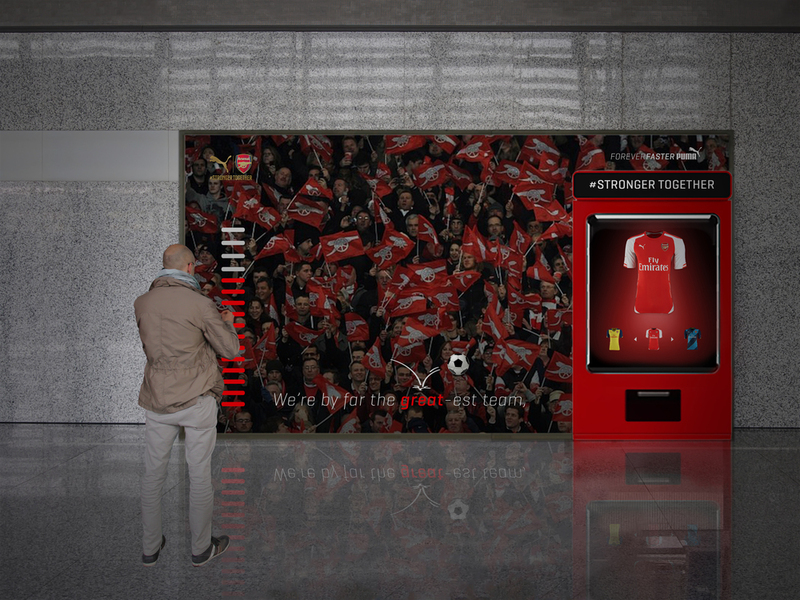 Rather than sticking out like a sore thumb after a hand ball, we created a vending machine powered by the sound of Arsenal chants. And to reinforce that our fans are stronger together, this vending machine requires a decibel level higher than any one person can reach. The cost of a free jersey: gathering passing fans, standing together arm-in-arm, and chanting the well-known hymns that unite the diehard Gooners. For soccer fans, a loss is way more than a loss. It's a pain you bring home with you, that you feel for days and perhaps take out on loved ones. To replace this awful pattern, the Arsenal Outlet lets you leave it all on the field – or at least at the stadium. Just enter the booth, step up to the mic, and unleash all your emotions. Yell about that awful call or curse out the forward's shortcomings. The Arsenal Outlet will turn those sound waves into electricity and store it for a greater purpose; in other words, converting negative energy into positive energy.